I’m sick! The kinda sick where I ache down to my teeth! But the show must go on and in order to keep my blog content fresh as a daisy I will soldier through, I’m a giver! That being said, I did pick an easy topic. It is smoke detectors and carbon monoxide detectors. My friendly HVAC techs who installed our furnace shamed me into replacing ours. As I have said in the past, just because I’m a home inspector does not mean my house is perfect. Far from it as my lovely wife can attest to. BTW, I love how she will say “We really need to get such and such done/fixed/installed/etc” when she really means me because if it was us she could just do it herself (Love ya’, honey. Mean it). Why does ours need to be replaced? Well, let me tell you. It’s time for Home Inspector Confessions (Kinda like Taxi Cab Confessions but muuuuch more boring). A while back I was jumping rope in our basement (Yes it is a tight fit, FYI) and I kept catching the jump rope on the smoke/carbon monoxide detector. Well any reasonable person would just remount it out-of-the-way, move a little one way or another or some other rational option. That being said, what did I do? With the jump rope hooked on to it I ripped it down in anger (At an inanimate object mind you) and broke it. Yes, always the best option. Problem…………solved?!?! So after being shamed by Ron and Anthony for not having a working detector I grabbed one at Lowe’s last time I was there. 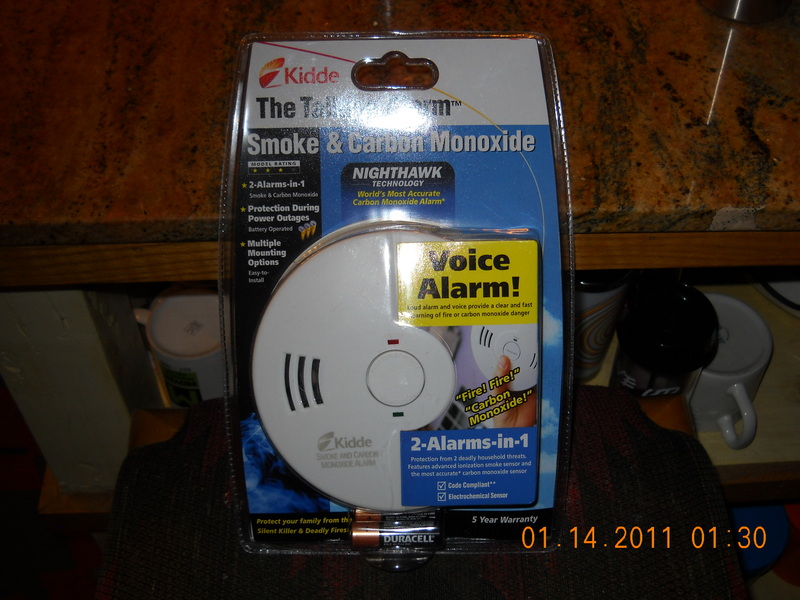 I got the combo smoke/carbon monoxide detector-in-one since I have a gas furnace and gas water heater. If yours are electric you do not need a carbon monoxide detector in your basement. If you have a gas stove or gas fireplace you could use the combo detector on that floor as well. The important thing to remember is to change your batteries at regular intervals. The rule of thumb is at every daylight savings time replace your batteries, so twice a year. If this bothers you to throw away possibly good batteries, try out some rechargeable ones. If you have a newer built home, you will have detectors that are hardwired in which means they will be supplied with electric on their own. This being said, you still have a battery back-up which should be changed regularly. It keeps your detector working even through a power outage. You can also buy the whole detector unit at a home improvement store if you need to replace the detector itself, just look for the hard-wire version. I always try to take the unit with me when shopping to make sure I get the right model unless you really like making multiple trips to the store for the same thing. Might get you out of grocery shopping or some other mundane task, though? Hmmm, something to remember for the future. Now, the units themselves. They actually are not good forever and need to be switched out occasionally as well. The home inspection tip is to replace all detector units at least every ten years. If you have moved in to a new house and are unsure about the age of your detectors, replace one every so often and write the date on the ceiling side of the unit (Unseen when installed) for you or the next person. My new smoke/carbon monoxide detector. Mmmmm, pretty! Well, that’s it. Gotta go blow my nose now. This is a good time to at least test your detectors to see if they presently work, they have a little test button on them. Might want to warn others in the household first, could be quite a shock! There’s nothing like one of those beeping alarms saying the battery is low going off at 2 in the am. Did it interrupt your early morning viewing of your favorite movie, Cars?